If you’re a fan of poker but like to stay away from table games when you’re playing online, then video poker is the ideal solution. Set out in a slots format but offering you the chance to play the popular rules of poker, video poker is a great way to indulge in your favorite game whilst playing against a computer. However, if you want to play with Realtime Gaming (RTG) or Cryptologic software, then there are a few important variations which you must include in your game play. Whilst RTG has no major differences in the actual gaming of video poker, its wagering system is different. Instead of video poker games automatically withdrawing wagered amounts from your online casino account, you have to preload the game with a certain amount of credits. These can then be played with, transferring more credits into the game as you play. Likewise, you must ensure that you transfer winnings back to your account at the end of your gaming session as this too is not automatic. Though credits can be cashed back to your account at any time, they will remain in the game if you forget to release them. With this slight change in bankroll, a new question will arise; how much should be transferred initially? This will of course be highly varied depending on how much you’ve played video poker before and how much time you intend on playing the slot for. It is best to take a responsible approach to your bankroll, and set limits of how much you transfer for specific periods of time. For example, if you want to play with 1,000 credits for an hour, then only transfer 1,000 credits. If they run out before the hour is up then you should attempt to not reload any more money into the game. Likewise, when the hour ends, you should transfer out all of your remaining credits back into your casino balance. To win at video poker, you will need to have plenty of luck and some great skills. You will need to have luck when you receive your cards. However, when we are discussing about the necessary skills, we need to mention more aspects. It does not matter what kind of game play strategy you use, you can always depend on the following tips to win at video poker. Before you even begin playing, you will need to analyze the payout schedule, as they will point out the winnings that you will receive at every hand. You need to know that 9/6 is a full pay in a Jacks or Better Video Poker game. Therefore, in case you make a Flush, you will obtain 6 coins, and when you make a Full House, you will obtain 9 coins. Most of the casinos pay out less than 9/6, so don`t expect to win big money when playing in the long run. A popular mistake performed by most beginner players is to play fewer coins at the hands. To obtain more coins when you make a Royal Flush, you need to bet max coins. You should play at a low coin size in case you worry that your bankroll will finish too fast. You can always play a free version of video poker to get used to the playing styles. Winning in Video Poker involves having some luck. Don`t try to increase your luck pumping coins into the machine. You will not be able to win every day, so don`t exaggerate in your bets. You need to quit playing as soon as you reached the limit of money that you are willing to lose. In this game, you will be facing a machine, and there is no time limit involved. Pay attention to the cards that you receive every hand. Make your move carefully since there is no time limit involved in the game. Wait until you are ready to press the draw button. Playing free games can help you increase your experience in case you are at the beginning of the road. You will find a “Play for free” version of the game at every online casino that you choose. You can develop and improve your own strategy simply by taking advantage of these free versions. Years ago you could walk into a casino, head straight to the bar for an adult beverage, and play video poker slots on the countertop. It was a way to keep the customers gambling, and you a way to win some money. Even though some would say the odds at the bar were worse than on the floor, this is just a myth. This is just a myth and the same goes for online video poker. Today, let’s go over a few easy rules and strategies. Hopefully it will increase your odds of winning. The simple rules are you are dealt five cards. You don’t play against a dealer (which helps), so the only thing you have to do is get a pair of Jacks or anything better to win. So, let’s say you have A, J, 9, 7, 2 in your initial hand. Since you need a pair of Jacks or better, you would want to discard the 9, 7, 2 and hope the three new cards have an Ace, Jack, or a higher pair to help you win. Understanding Jacks or better video poker is pretty simple, and if you’re a poker player, you already understand the game, so it’s kind of like those Captain Obvious commercials. However, if you haven’t played before and want to learn more just read the rules and get the basics down. The strategies I discuss below will be more important to memorize. When you’re gambling, it’s real easy to get sucked into going for the biggest win. However, the chances are greatly diminished when you take this approach. If you want to win money over the long term, you have to be consistent with your strategy. 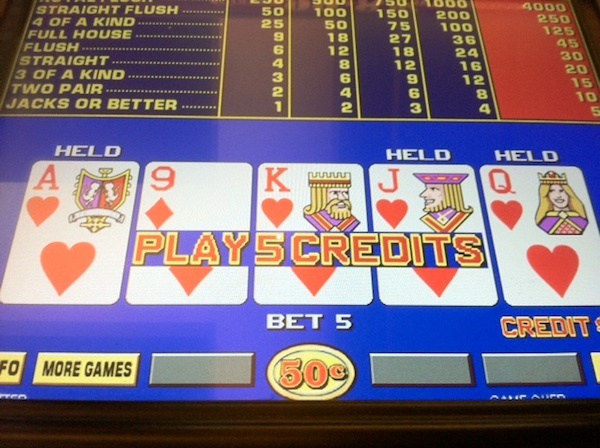 One of the most common “potential” wins in Video Poker is a flush. Flushes require all cards to be the same suit, and video poker loves spitting out 4 cards of the same suit, in one hand. Do you go for the flush? This depends on whether or not you have a chance with anything else. If you are up in regards to your bankroll, then I would tell you; YES. If you’re down, you want to focus on consistent wins, especially if you have a few high cards (jacks or above) in your hand. The point is; you should try for the flush in some instances, but don’t do it every time. Remember that the house has the odds, and most of the time a flush won’t surface. I have done this myself over the years (I wasn’t as smart back then, lol) and it bit me in the back side. For instance, there have been several times I’ve had a pair of Jacks, Queens, Kings, or Aces in my hand, but had a chance to win a straight, flush, or three-of-a-kind. Now, over the past 30 years this has probably happened a couple hundred times, and unfortunately I can’t remember winning once. So any time you have Jacks or better from the get-go, take the win and try to build on it with two pair if you have another high card, or a three-of-a-kind. It’s easy to see that these are basic rules and strategies to video poker. I’ll go more in-depth in my next piece, when you’re ready to take your knowledge to the next level. One of the most exciting casino games that players can enjoy in a mobile casino is video poker. As is the case with most casino games, it was developed for land-based gaming venues such as pubs and casinos, but just like slots, it has successfully been transferred online and now, with wireless network technologies, to mobile devices as well. 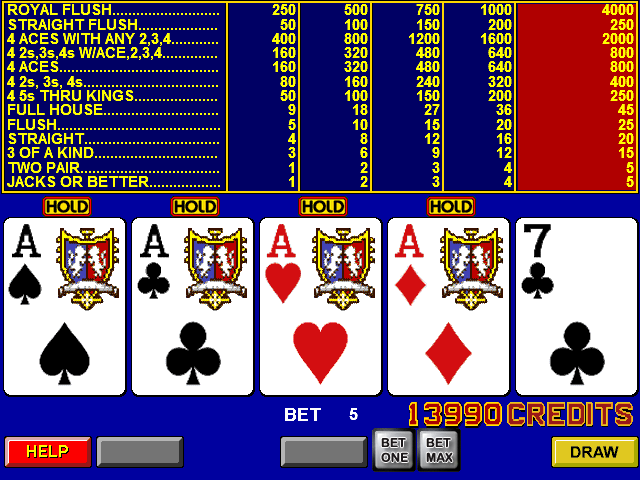 Generally, video poker games are based on the classic five-card draw poker; however, instead of competing against other players, the player uses a machine. Similarly to slots, the player does not need to worry that other, more seasoned players are going to take advantage of his or her lack of experience. On the contrary, with this type of casino game you bet against “the house”. This is what makes this game particularly appropriate for players on the go who do not need to worry that they are going to lose money to other players due to a lack of concentration. So, how exactly does one play video poker? Even though there might be different game variations, the rules are quite simple and easy to grasp. First, you need to bet a certain amount of money or credits and then you click on the “deal” button. You are then given cards from a virtual deck. Just like in a regular poker game, you need to look at the cards that you have been dealt, and make a decision whether to substitute one or more of those cards for other cards from the virtual deck. Naturally, the purpose is to build the strongest card combination possible, since the game will pay out if the hand or hands played match any of the winning combinations in the game. 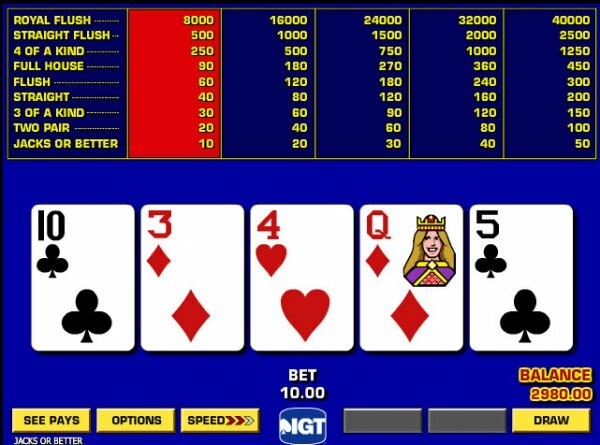 Even though the rules of the different video poker games are quite similar, there are nevertheless different variations, with “Deuces Wild” and “Jacks or Better” being the most common ones. In “Deuces Wild”, the main rule is that all twos can be used as wildcards, meaning that you can use them as a substitute for any other card in the deck that you might need so as to form a better winning combination. As for “Jacks or Better”, which is also called “Draw Poker”, the payoffs in the game begin at a pair of jacks. If you have decided to try some video poker games in a mobile casino, you basically need to register at that casino (if you are a new player, that is) and then check whether you need to download the casino software or whether you are able to use the flash casino option. Usually, mobile casinos offer a demo mode for video poker as well, which will help players get acquainted with the game rules and learn more about the different game variations and combinations that can potentially bring them more winnings. This is quite important, since the player needs to make certain decisions which will have an impact on the outcome of the game. Who Spreads These Superstitions, Anyway? One of the aspects of video poker that people enjoy is the solitary nature of the game. If you’re looking for camaraderie, you’d probably be better off playing craps or roulette, where there’s a decided social aspect to playing. But sure enough, if you hang out long enough in the video poker section of a casino, some well-meaning but foolish person will start sharing video poker myths and misconceptions with you. 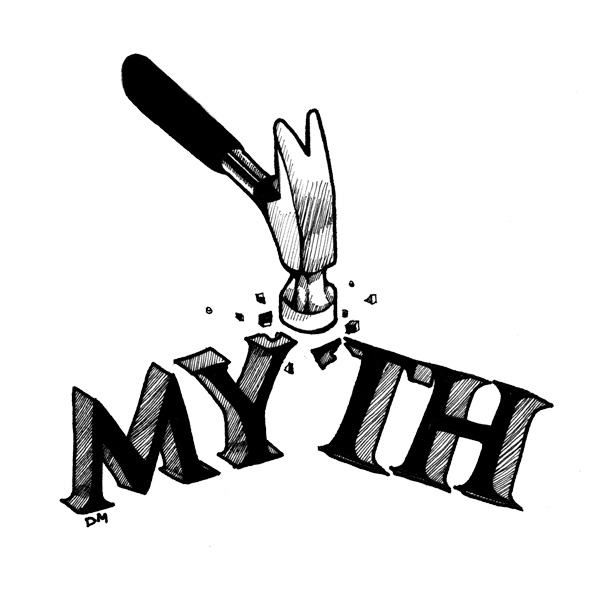 I’ve listed some of those myths here. Higher denomination machines have better payouts. There is a kernel of truth in this one, because higher denomination machines will usually have a better pay table. But the pay table is what determines the payout percentage, not the denomination of the machine. So don’t make the mistake of thinking that two machines with different denominations but the same payback table will pay out differently, because they will pay out exactly the same. Quarter machines are cheap action. At first it would seem that this is true, and they certainly offer cheaper action than dollar machines. But consider this: you’re going to play the max bet each hand, which means you’ll be betting $1.25 per hand. And you’ll probably play close to 600 hands per hour. That’s $750 worth of action in an hour! There are “good” machines which offer more royals than typical, and there are “bad” machines which offer fewer royals than is typical. This is conspiracy thinking. The truth of the matter is that once every 40,000 hands or so, you’ll see a royal flush. The machines have tightly controlled random number generators (RNG’s), and they’re licensed and regulated. The casino gets its advantage from the payback table of the machine, not from tricks with machines that don’t pay out correctly. A machine that just hit a royal is “cold” and not due for a royal anytime soon. And a machine that hasn’t hit a royal in a while is “due” and is a better bet than a cold machine. The RNG (random number generator) shuffles and deals from its virtual deck every hand, regardless of what the payout on the previous hand was. There’s no such thing as a cold or hot video poker machine, unless you’re referring to the pay tables. Being aware of what the truth about the odds are in video poker make you a better player. If you’re spending your time and effort on something futile like finding a hot machine that’s “due”, or you’re playing high denomination machines just because you think they’ll pay out better based on the stakes, then you’re putting yourself at a disadvantage. You’ll gain an advantage by learning what are good pay tables, and by learning how to play with perfect strategy. Focusing energy away from that is going to cost you more money in the long run. Like blackjack, video poker involves making decisions that affect the profitability or lack of profitability in your play. If you’re playing on an appropriate machine, and if you can play perfectly, you can get the house edge down to 0.46% or lower. Blackjack players who are really good might be able to beat those odds, but that ain’t easy–have you tried counting cards? That’s the only way to get a better payout percentage playing blackjack as opposed to video poker. Video poker is dead easy, and I can play it by myself. When you’re playing blackjack and you want to think about a decision, you might have a whole table full of people staring at you while you make your decision. I can’t stand that kind of pressure. Give me the solitude and comfort of a video poker parlor any day, thanks. Video poker is similar to slot machines and has something in common with poker besides just the name. The decisions you make affect how much you win or lose. That’s the biggest difference between a video poker machine and a slot machine, by the way–no matter what decision you make while playing a slot machine, it has no effect on the mathematical outcome of the game. This site aims to teach you how to play video poker. There are two reasons we recommend playing video poker – one is that it’s a lot of fun! The other is that we think video poker is your best chance of winning against the casino in the long run. No other casino game gives you the chance to win with less effort than video poker.